With a toddler that sticks to me nearly every second of the day, it's been really tough trying to find time to sit down for a nice art and craft session with the kids. He tends to destroy, or eats, everything he sees so it's a challenge trying to stop him from ruining our moment or getting all the toxic in his tummy. That also means I'm guilty as charged and haven't really exposed this little one to as much art and craft as his sisters did when they were his age. 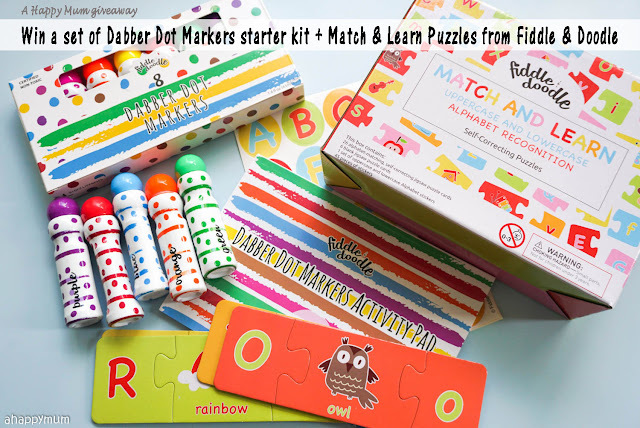 So, I really needed a surge of motivation this month and was on the lookout for new materials and activities to enthrall the kids and was very excited when Fiddle & Doodle sent over their products - the Dabber Dot Markers starter kit and the Match & earn Puzzles. In today's Creativity 521, I'll be sharing more about how they have provided us with hours of fun and for those who are interested to win a set, there will be a giveaway at the end of the post too! See how colourful and vibrant everything looks? The kids were thrilled even once they laid their eyes on these new materials and couldn't wait to start exploring more! If you are wondering what dot markers are, they are basically markers with big, round sponge tip applicators that make perfect dots. 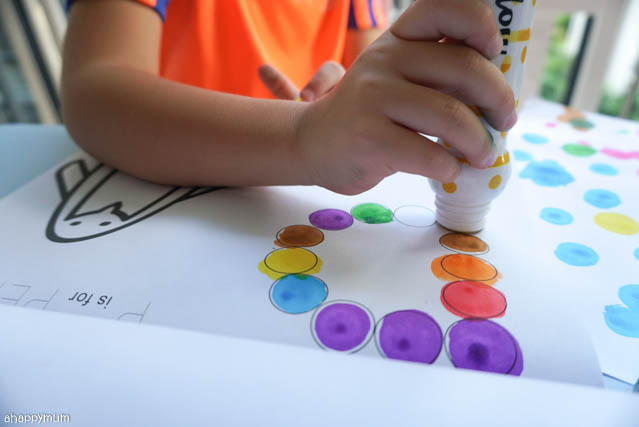 You can dab, dot, mix, blend or layer them to create your very own masterpiece and the best thing is dot markers can provide lots of colourful fun but are generally easy to clean up. 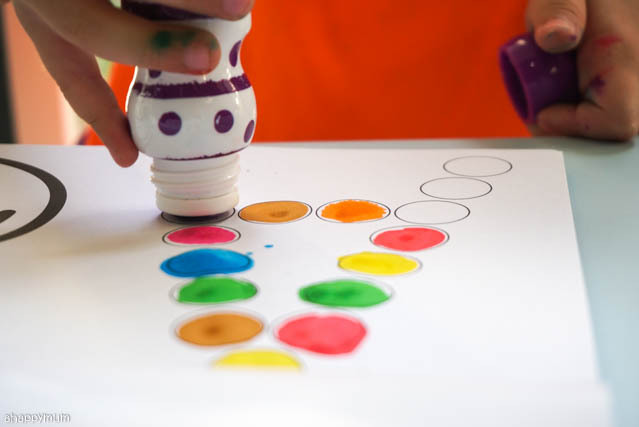 The Dabber Dot Markers come in a box of 8 vibrant colours - Red, Blue, Yellow, Orange, Pink, Green, Brown, Purple. They are ergonomically designed for little hands and are easy to hold, paint and draw. 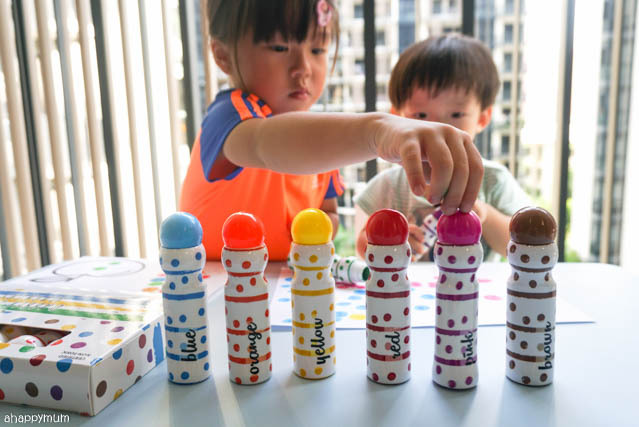 Even though it is stated that the markers are suitable for children aged 3 and above, the 18-month-old toddler can also grip them really well and he is very excited that he can make colourful dots so easily! Well, we just have to make sure that he doesn't swallow them, right? Anyway, parents with curious little ones will feel more assured knowing that Dabber Dot Markers have been lab-tested and certified toxic free by a toxicologist. 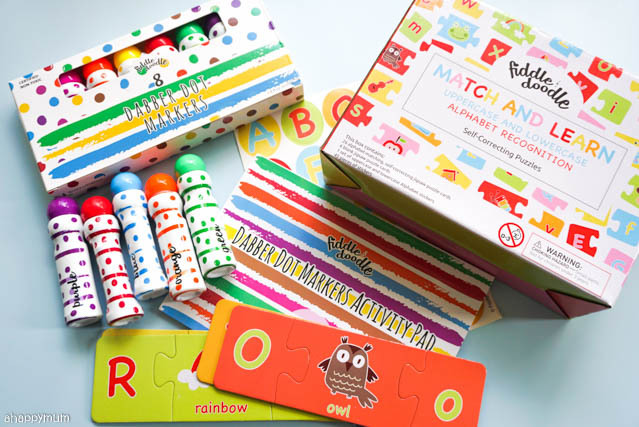 Inside the starter kit, besides the markers, you can also find an activity pad with over 30 activity sheets including alphabets, numbers and colouring fun. 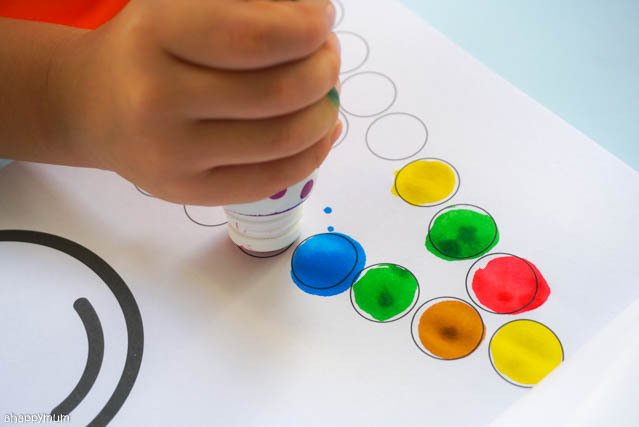 The 4-year-old was delighted with the pad because not only was she able to use the dot markers to form letters, she could also practise her letter recognition, phonics and learn to spell new words too. So while the toddler was happy to be just dotting away on a piece of blank paper, it was the little sister who enjoyed the activity sheets most and had fun making her own rainbow coloured alphabets. While they both had lots of fun, we also realised that they eventually stained their hands pretty much with the markers and this took a while to wash off too. Oh well, it was still very worthwhile for the much needed and long awaited art session for the kids. 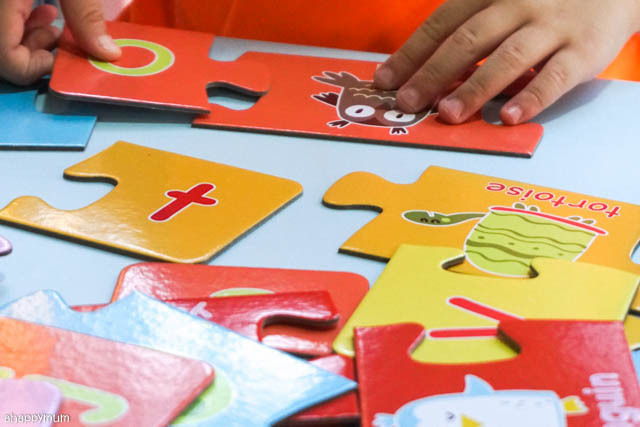 Even though puzzles might be far too challenging for the 1-year-old now, the two sisters definitely enjoy trying to solve all kinds of puzzles. 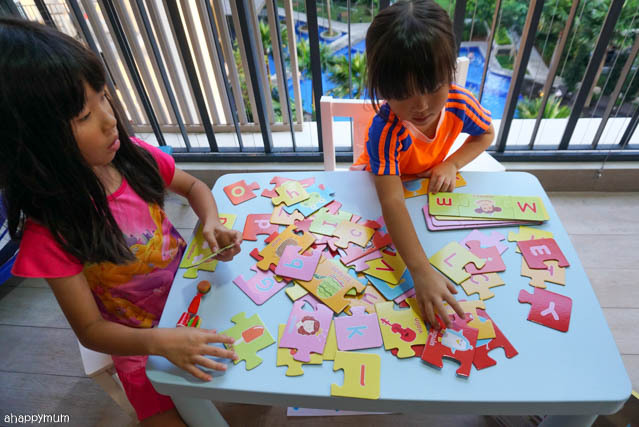 The Match & Learn Puzzles consist of the 26 alphabets and each puzzle set has the uppercase alphabet, matching lowercase alphabet and the picture of an object/animal that begins with the corresponding letter. 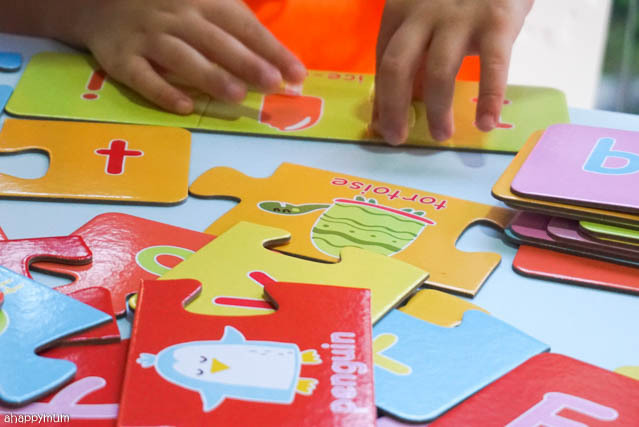 For the preschooler who is learning her alphabet, has difficulty differentiating her 'b's from 'd's and is keen to try to spell new words, these puzzles intrigue her and is a good way for her to strengthen her foundation while playing and having fun at the same time. 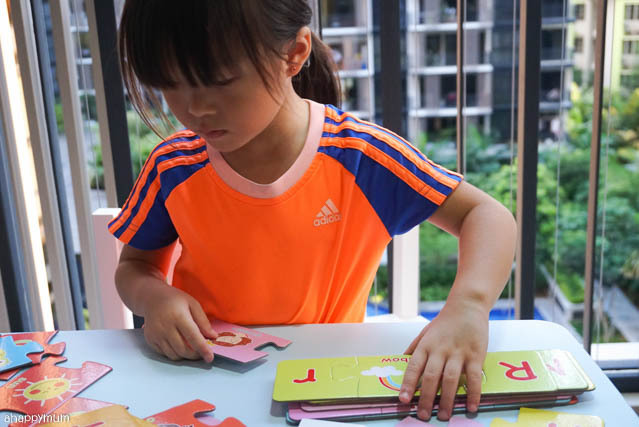 For the primary preschooler, while the puzzles are way too easy for her, she still enjoys fishing for the right piece from the sea of puzzles and have a nice, bonding session with her littler sister. I believe it's always best to learn through fun, don't you think so? 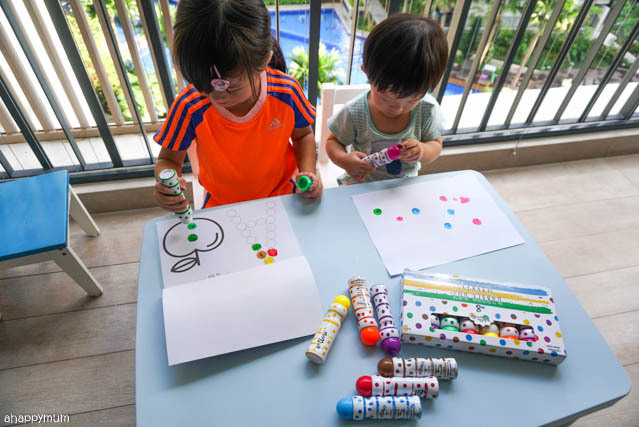 I'm glad that both the dot markers and puzzles are providing the kids with lots of educational fun, teaching them about spelling and alphabets while helping to improve their dexterity and hand-eye coordination. Hopefully, this will spur us on to keep our creative sessions going because as tough as it is getting to be, I really hope to keep up with the Creativity 521 series. Good news, for those of you who are keen to own a set of the Dabber Dot Markers starter kit and the Match & Learn Puzzles, here's a giveaway! To join in this giveaway, leave a comment in this post with your name and email address. Indicate in the Rafflecopter widget that you have done so and to increase your chances of winning, you can choose to carry out the rest of the options. Best of luck, everyone! a Rafflecopter giveaway Disclosure: We received the Dabber Dot Markers starter kit and Match & Learn Puzzles from Fiddle & Doodle for review purposes. All opinions are our own. I hope to win this for my little girl. 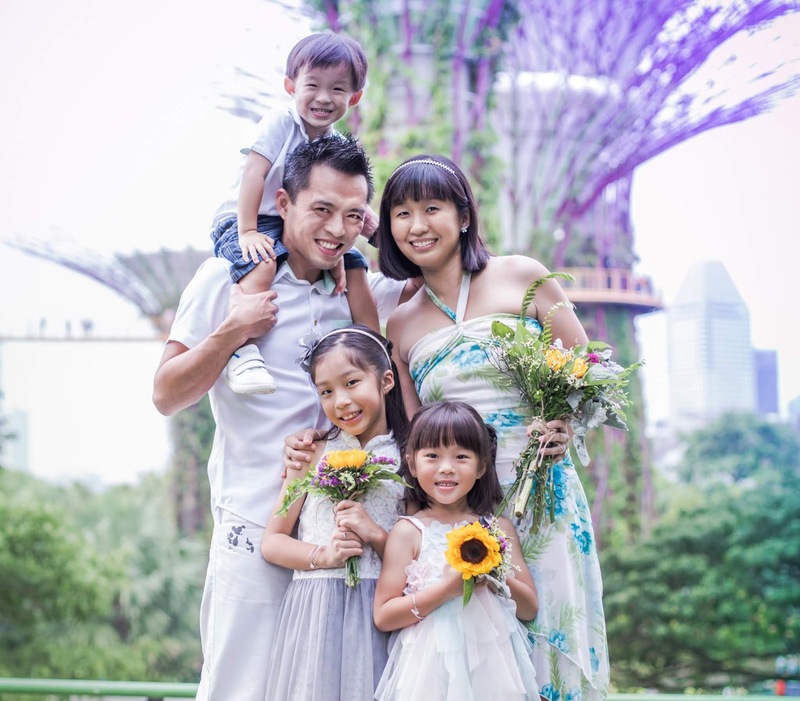 I would like to win a set for my 3 kids aged 4+,3+ & 2. My 3 year old has poor pencil grip and I believe the dot markers will be really helpful for him. All my 3 kids love puzzles too, these would definitely be fun and educational activities to keep them engaged. I hope to win for my kids especially he started to have abit more interest in art & craft now. Looks fun! I'd to win a set for my girls. Hope my 5yr & 2yr old can have fun while learning with art activities. I hope to win the set for my toddler who loves drawing and scribbing. I hope to win for my 2 & 3 year old children. Thank you for the giveaway. My 2 boys love activities like these! So hoping to win a set for them! Hope to win this giveaway set for my 2yo birthday! Always love bonding session with her through art work. This would be useful for my kids who aren't still having problems with their alphabets. Thanks for cute giveaway to let my girl give wings to her creativity. I hope to win this for my 3yo girl as she loves to draw and colour. 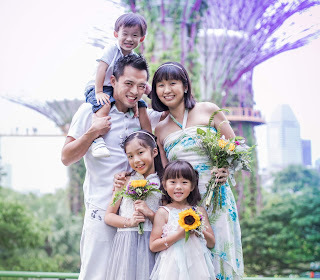 Hope to win this for her and her 3 yo Jie Jie! Hi, This looks very fun and my little one would love this set of materials! It looks so fun I can't wait to try it with the terrors at home! Hope to win a set for my kids. This is cool! My 4 years old will be excited to learn alphabets the fun way! Looks fun and easy to clean up! Hope to win this for my little boy and keep him entertained while learning something new! Hope to win this for my boy! Ive been eyeing the dot markers for the longest time! would love to win this for my little boy who sticks to me like super glue!! this would definitely help develop his creative and artistic side!! Wanting the dot markers too! 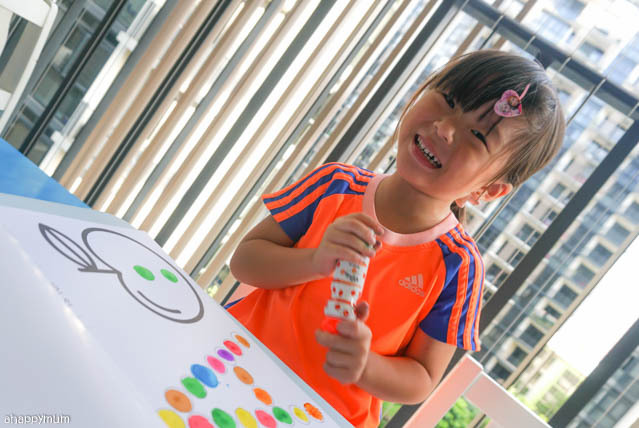 Hope to win for my 5years old son, now he love drawing.Sometime he will follow Titanic movie to draw sinking cruise or draw he like that planet.Hope win this Dabber Dot Markers starter kit to help he creative drawing paper more wonderful. Hope to win for my 5years old daughter and 3years old son who love drawing and arts and crafts. It looks fun and able to train their creavitity. Would love to win this as I have be searching for such activity to do with my little one. He loves craft and Colours! My girls love dot markers.. Wonderful activity kit to engage young ones! looks so beautiful! I have just started art and craft with my 20 month old girl. She would love to have these kits! Thank you for the giveaway. I always wanted to get a do a dot marker set for my kids. This looks the same and I like the activity sheets that comes along with it. This caught my attention at first scroll through facebook. Kudos to the innovative designs. We, Tharika Ayub would love our daughter to explore her creativity with this set. My email address is tharika.ms@gmail.com. Would love to win this for my niece!! A perfect activity for us to do with her when she's home on Sundays! My 2 girls love art and crafts.hope I can win the kits for them. Hope to win the dot markers for my tiny tots! Hopes to win this for my 2 boys! Love to win this for my girl! Hope to win a set. Love to win a set for my boys! Looks fun! Hope to win a set for my kids to play with. They love art so much! Hope to win this for my 2 preschoolers (nursery 2 boy ~ 2013 & nursery 1 girl ~ 2014) with only 1.5 years age gap, they are learning everything and having fun together! oh wow didnt know that there is such an amazing learning tool! thanks for sharing about this, with so many interesting photos and useful information. hope to win this for my lil girl!